Miller Updegraff, Pitching Woo, 2013, acrylic on canvas, 47 x 39". In a kind of homecoming for the artist George Grosz—who lived and taught in New York City for two decades until his death in 1955—Miller Updegraff’s latest solo show lends new life to the exiled German’s most salient motifs: bourgeois pigs and prostitutes, military officials and disaffected city denizens. Adapting tropes from Grosz’s drawings of the 1920s, Updegraff’s paintings form at once a palimpsest and a compendium of his work: withering X-rays of Weimar Germany’s social and political angst, rendered in caricatural line. Interestingly, in several instances Updegraff does not use pigment to delineate his forms, but rather extracts his lines from the gesso applied directly onto the canvas’s surface. The imagery is thus subtractive rather than additive; the painting’s (usually invisible) support becomes its medium. The homage to Grosz’s menagerie of interwar decadence is as deft as it is compelling. The overlapping and interruption of forms—a woman’s exposed, swollen flanks next to a dapper gentleman in Hunky Dori (all works 2013); a bloated, bow-tied bourgeois intersected by a flapper in Whisky Frisky—both invokes and exaggerates Grosz’s own pictorial strategies, especially those of cinematic montage and post-Cubist pictorial space. 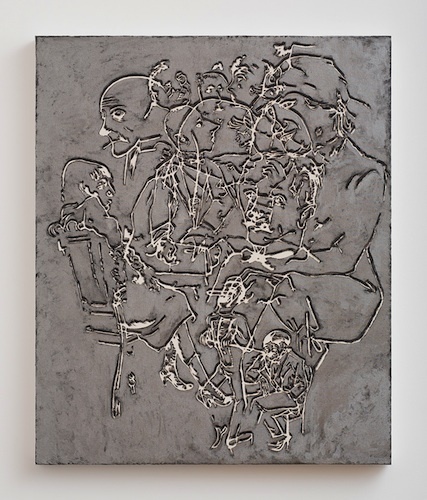 The silver acrylic of Pitching Woo features numerous figures superimposed in the same plane, all of which manage to retain their own humanity—indeed, each seems to exist only as an individual alienated from another. Enlivened with glitter, Cuckold makes striking use of its black arcylic and comparatively spare imagery, just as Pink Cigarette and In Like Flynn distill their subject matter to a few isolated figures, further revealing Updegraff’s adroit channeling of Grosz’s aesthetic—one which, a century later, still has much to say about the malaise of (post)modern urban living.